What’s that smell? It’s Patrick and his secret collection of wiffy old cycling shoes. Changing of the guard. Clips out, clipless in. There are two pieces of cycling kit I believe make a fundamental difference to your comfort and performance when riding: shorts and shoes. Shoes make a massive difference to performance and also comfort although this may not be obvious at first. 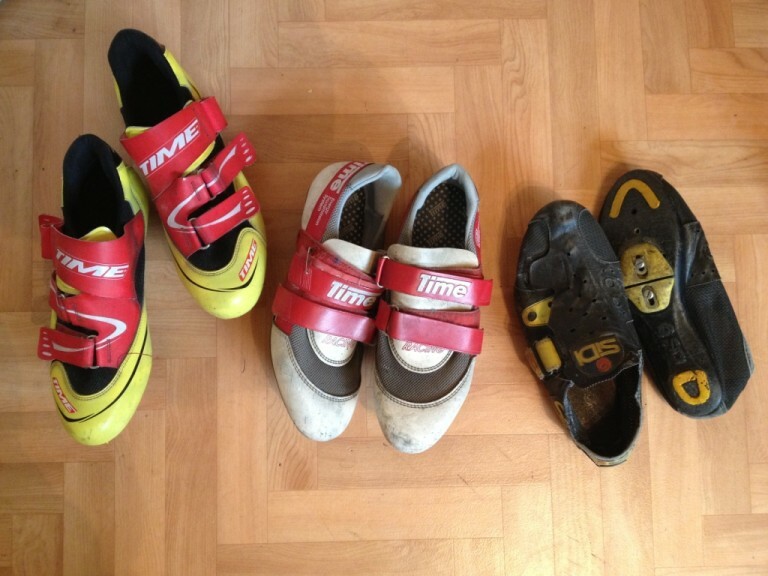 The performance benefit of any cycling shoes over trainers and flat pedals is incredible. I still remember the first time I used proper cycling shoes with clips and straps as opposed to trainers with spongy soles, it was like having a new lease of life and rode everywhere at least one gear higher. Not only that but it meant I had one of my first proper pieces of cycling kit and made me feel like a true cyclist. The first time you try cycling shoes and clipless pedals you are usually more concerned about falling over and not being unable to get your foot out. Once this initial fear is conquered though the difference in power transfer becomes obvious and very soon you’ll wonder how you ever got by without proper shoes and pedals. 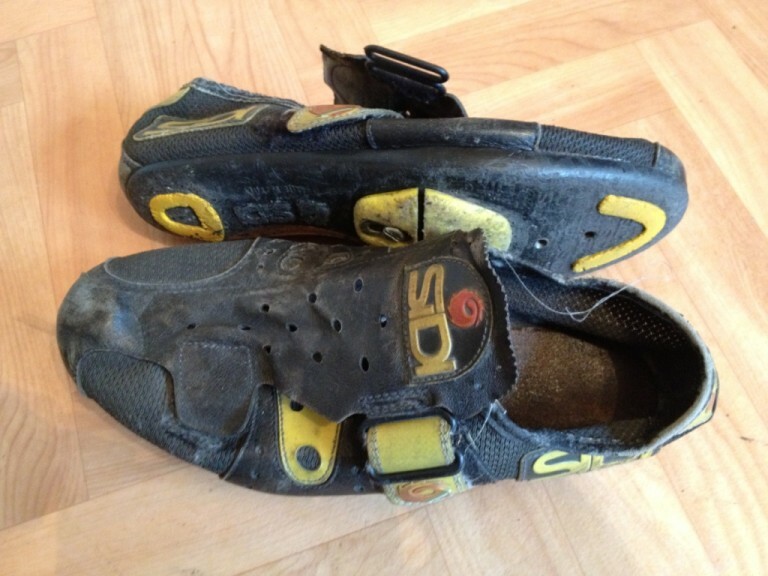 These were my first cycling shoes and the fact they were SiDi made them special. It doesn’t matter that they were second hand from a club mate – the fact he had won many races and a stage of the prestigious Irish stage race the Ras in them only added to the prestige. I rode more in the week following getting them than at any other time previous and couldn’t wait to get home from school to put them on and go out riding. This was the late 1980’s and so I was still on toe clips and straps and the difference over trainers was overwhelming. Not only did they fit into the straps better but having a cleat to locate the shoe and stop the foot from moving around also felt much better. As for the shoes, there was only one real securing Velcro strap at the rear of the shoe as the front one was a simple tab which kept the shoe cover in place but this was all that was needed as the clips and straps kept the shoe secure. They weighed nothing, were well ventilated (AKA frostbite in the winter months), the soles were wafer thin but stiff and gripped my foot like a rock climbing shoe. The yellow SiDi logo made them stand out and the fact that French legend Laurent Fignon used the same shoes only added to the look. These were the only shoes that I used with clips and straps and when I look at them now I wonder how I ever managed all the miles I did in them without crashing, succumbing to the cold with frostbite in the winter or simply giving up through lack of comfort. Still, that’s cycling in a nutshell isn’t it? I still love these shoes for what they stand for. A shout back to another era. Clipless pedals were just coming in when I first started cycling but they were considered exotic and potentially bad for your knees due to lack of movement (although we used to strap our feet so tight into clips and straps they never moved anyway). 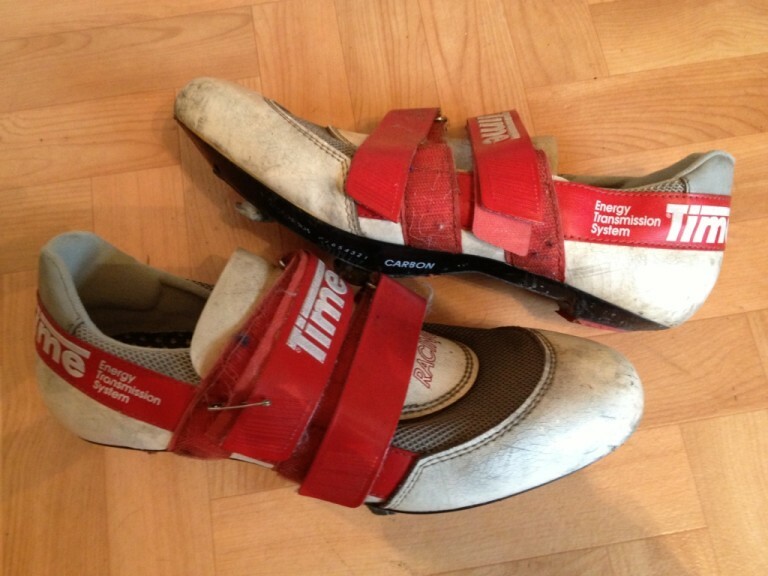 I held out for a few years before trying Look pedals but I was never quite happy with them – even with the red cleats that offered more float. My mate suggested Time pedals as they had way more float both (side to side and rotational). But they were more expensive and I had to have Time shoes to go with them. So the penny saving started again. On the plus side they had a very good reputation for being kind to the knees. Most of the professional peloton and big stars were using them and white shoes were so cool as everything else was dark. I saved for ages then bought the pedals and shoes together. Only problem was it was February and there was no way I was getting these pristine white shoes dirty! So they sat like trophies in my room until the weather got good enough to use them. Once I used them, I never looked back. I have never had any problems with my knees since then and still use Time pedals to this day. These shoes were so comfy and bombproof. I battered them for years and years without fault and when the Velcro finally separated from the strap one day and it was finally time to replace them, I was gutted. The colour was by now yellow instead of white but they still had the unique Time TBT two plate cleat fitting sole and still looked like Time shoes. 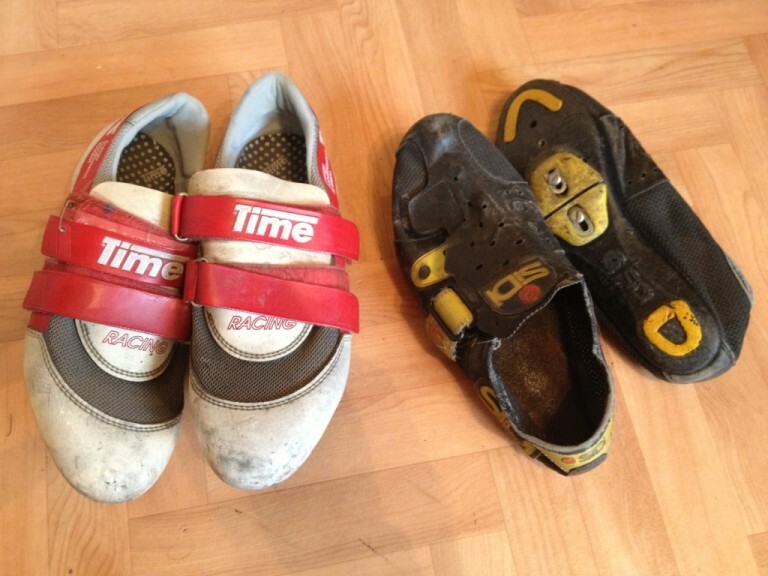 For me these two pairs of shoes represent a changing of the guard in terms of cycling for me. The SiDis were the simpleness of starting out in cycling, toe clips and straps, hairnet helmets, downtube non-indexed shifters and basic kit. The Times were clipless pedals, STI levers, Oakley sunnies, hardshell helmets and wonder fabrics. How things changed so quickly. Tagged clutter, footwear, parts bin, retro, retrobike, sidi, time, vintage. Bookmark the permalink.